Disclosure: I received a free product for this review. Opinions are 100% my own! Thinking of what to get for your baby now a days is exhausting! Especially for those of us who haven’t had a baby to buy for in over 30 years! LOL Well, the first thing I know every baby will need is Diapers! Being a blogger, I thought I’d pitch a company for a diaper sampler pack so my daughter and son in law can choose what they liked best for their baby girl. The Miny Moe diaper sampler packs are super cool! The Green Booty Sampler includes 20 diapers, 5 from each of following 4 top Eco-friendly disposable diaper brands (The Honest Company, Earth’s Best® TenderCare, Naty® by Nature Babycare, Seventh Generation® Free & Clear), so parents can try them and find out which is best for their baby. All of these green brands are free of chlorine, latex, and fragrance. Each brand’s pack is individually sealed with score card enclosed to help you keep track of how they performed and ultimately find the best diaper brand for your baby! Finding the best brand of diapers for your baby can be an overwhelming and expensive task. With so many brands available in stores and online, how would you even know which ones to buy and which ones to ignore? When my daughter was in diapers, I used Pampers and Huggies, those were the only 2 brands out! Now you not only have those 2 brands, but there are organic and store brands too! In the end, what it will come down to is what works best for your baby, because all babies are unique. The Miny Moe Diaper Sampler Pack is a great idea for new parents. and it makes a great baby shower gift. It takes the guesswork out of shopping for diapers and allows parents to try an assortment of brands. You can also order a package of 6 diapers (one of each brand) or 30 (5 of each brand). My daughter wants to breastfeed, and that’s a good thing, however, I was not able to breast feed, so I am wondering if my daughter will be the same. This is why I only got the sample pack for her, I will get more if she needs them if she doesn’t get them at her shower. Miny Moe has offered to sponsor our Baby Shower Giveaway Event! They are going to give one lucky reader a “Green Booty” 4-Brand Diaper Sampler (winner’s choice of size NB or 1) and Basic Mama 3-Brand Disposable Nursing Pad Sampler, total value $24! 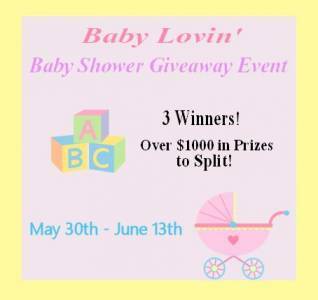 May 30 – June 13th 2014, My Frugal Savings will be hosting a Baby Lovin Baby Shower Giveaway event in honor of my daughter’s Baby Shower May 17th! There will be multiple baby products, including the product above, and prizes split between 3 winners to be sure to bookmark my blog and check back to enter! Disclaimer: I would like to thank Miny Moe for allowing my daughter to review the 4 pack diaper sampler and nursing pad sampler ($24 Value). No compensation was exchanged. Neither my daughter or I were required to write a positive review. Our opinions of this product is entirely our own. Read the full disclosure policy.